The bascinet was a Medieval European military helmet. It evolved from a type of iron or steel skullcap, but had a more pointed apex to the skull, and it extended downwards at the rear and sides to afford protection for the neck. A visor (face guard) was often employed from ca. 1330 to protect the exposed face. 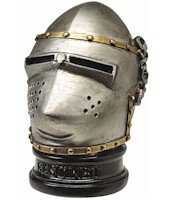 This 5.5cm model of a Bascinet Helmet is made from resin. The model is supplied in a white box with a label on the front.